Let’s ring in the New Year with a brand new S.O.A.P. panel team. Don’t know what S.O.A.P. is? Check out this mash up post to learn more about it and check out our spring 2013 team here. We are looking for the newest fragrances to add the Bramble Berry lineup and we want your help again! For the next week, we are on the lookout for eight soapy fans to help us pick which fragrances to add for our Spring 2014 fragrance oil line. 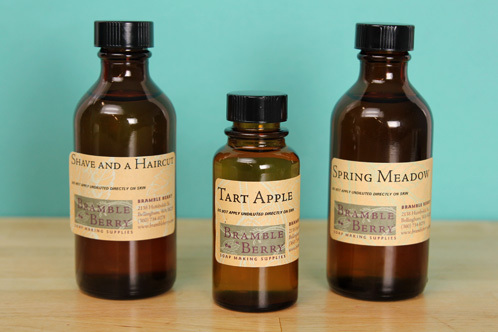 The S.O.A.P Panel is one way Bramble Berry decides to bring on new fragrance oils. Throughout the year, hundreds — if not thousands — of fragrance oils specifically designed for Bramble Berry roll through the office, and the S.O.A.P. Panel is the final test for some of them. They’ve already gone through our own internal inspection process (including initial CP tests), and we’d love for you to give them a sniff and test them in any bath and body product. Cold process soap, melt and pour, lotions, butters — whatever you can think of (well, aside from lip balms. None of the fragrances are lip safe)! For this panel, participants will receive eight 1 oz. fragrance samples to test. The catch? All the fragrances are mystery fragrances; they won’t have names to influence judgement because we want honest opinions. You’ll fill out a survey to tell us about your top choices, and this is important because your notes will determine the fragrance people in our soaping community will use! Tweet, Facebook, Pin, Instagram or blog about your favorite Bramble Berry product (including the links) and why you should be selected for the Winter 2014 S.O.A.P. team. Be sure to link to your social media outlet update in the comments below so that we can read about it. The last day to enter will be January 15. You can still post about your favorite BB product, but you won’t be considered for the panel! Team members will be announced on Friday, January 17 and the samples will be sent out by January 24. Completed surveys need to be returned by March 14. Note: You’ll have about about 7 weeks to test the fragrances. Please keep these dates in mind before you enter. We are looking for an accountable and enthusiastic panel, so be sure that this works out with your schedule! Because these fragrances can’t ship internationally, we are not able accept international entries. Some previous SOAP Panel posts are here, here and here. This post is a fantastic example of what previous S.O.A.P. panel members have done for testing, blogging and tweeting. DARN IT! I MISSED IT! I’ve already entered the contest, but wanted to throw in my second FB post as well, just because the SOAP panel has been on my mind so much as I make new batches of soap. I love the FO’s and EO’s you guys sell (ha! I almost wrote smell there! ), and one of my favorite things to do is pull out my huge box of FO and EO and just open them all up to smell and work on fragrance combos! Thanks so much for applying a second time :)! Good luck! Thanks so much for applying! 🙂 We appreicate you’re support! Our BLOG about Bramble Berry! Our favorite scent …right now… is Smokey Patchouli! Hi there, I submitted my links this morning but don’t see them posted here. Can you please confirm whether you got them? I don’t want to miss the deadline. Thanks! Hello and thanks for considering me to be part of the S.O.A.P panel for 2014! I’ve been combining my love of soapmaking with my former one of digital scrapbooking design, trying to integrate my sense of color and design with my sense of scent in soapmaking. I think that I have a unique perspective from a graphic designer’s view of color and how it relates to our sense of smell. I’ve created two digital scrapbooking freebie items that are available for free download at my store. I made a 3rd, a set of Photoshop patterns, but my website isn’t allowing uploads today for some reason, so I can’t upload it yet. It’ll be up in the next day or two. I’m planning to do these once a month or so. Ancient Sedona blog post and digital scrapbooking freebie: Coming soon! I love that Bramble Berry does this. Real answers from real customers. Ok, I know, I’m an international customer, yeah! From Canada! But, I would SSSOOOOO love to be part of the S.O.A.P panel this year! Your videos are great, thanks so much for applying! Nervous excitement! Maybe the third year is the charm? Here’s to hoping!! My 9 bar birchwood mold is my favorite product, but its the customer service that keeps me coming back! You guys are the best! The 9 Bar Birchwood Mold is such a great choice! Thanks so much for the kind words and support 🙂 We really appreciate it! How can you make us pick just one favorite? Participating on the SOAP Panel would be amazing. I would love the opportunity to be a part of testing new scents for the Spring 2014 fragrance oil line. Thanks so much for applying, and for your support! I’m glad you love the Mango Butter, it’s a must have product for me too! Thanks for applying! I love Brambleberry’s fragrance oils. You are the only company that I trust to get them from at this point. I just finished making soap with the Southern Peach fragrance oil. I love it the fragrance oil makes it light and fresh and the tea just makes it better. I’m so happy you’ve been enjoying the Southern Peach Fragrance Oil, isn’t it a great scent? Thanks for applying! Thanks so much for your support, and thanks for applying! I have been waiting for another chance to be a part of the S.O.A.P. panel, so here it goes! Thanks so much for applying, and thanks for being a part of our soaping community! I recently received a sample of “Cucumber Melon Fragrance Oil” with my Bramble Berry order, and I’m in love. It behaved perfectly in my cold process soap. I experienced no discoloration, ricing, or acceleration. After using this fragrance oil, I decided to try to join the Winter 2014 S.O.A.P. team for the chance to try other great fragrances. As a new soaper I think I would be an awesome asset to the Winter 2014 S.O.A.P. team. I’ve only used a handful of fragrance oils, so I’m unbiased, and I can give an honest opinion. I should be chosen because I am a complete fragrance oil junkie. I swear half the soaps I make are so I can just enjoy how they make the house smell while they cure!! Thank you for taking the time to apply, we really appreciate it 🙂 Good luck! I really enjoy Bramble Berry and your products. I’ll be getting a new fragrance in today actually, Almond Biscotti, which I’m excited to try 🙂 I’ll also be trying out the Lots of Lather Quick Mix. I plan on making a small batch to test out the fragrance and possibly use the vanilla content to my advantage in the design department. You know if it wasn’t for Bramble Berry and Soap Queen Tv I wouldn’t even know soap making was possible…beyond Grandma’s Lye Soap. I love the Almond Biscotti Fragrance Oil, I hope you love it too! 🙂 Thank you so much for applying! As a dedicated soap maker with a love for fragrance and a bachelor’s degree in journalism, I would be honored to serve as a member on your S.O.A.P. fragrance panel. I’m a very accountable individual and am extremely enthusiastic about this opportunity! Thank you so much for the consideration. Hope I get lucky! I use Pinterest and Facebook, links below. Here is the link to my Pinterest post. Thanks for the opportunity! I’m giddy! Here’s my pin! Check out my Soap Board on Pinterest. I have 593 pins and 456! Thanks so much for the pin, and thanks for applying! Hi! I love Bramble Berry fragrances and all the neon colorants! I would love to be a part of the panel! I have been soaping for about 10 years now. I have a shop on Etsy for the past 2 years. I think this is a great opportunity to become more a part of our soaping community. Thanks so much for applying, I took a look at your soaps, they are beautiful! Hi! I love Bramble Berry fragrances and all the powdered colorants! I would love to be a part of the panel! I have been soaping for about 10 years now. I have a shop on Etsy for the past 2 years. I think this is a great opportunity to become more a part of our soaping community. Those are awesome and unique fragrances, so glad you love them like we do! I apologize for my last post as it was the incorrect link. Here is the correct one! I’m in the process of starting my own small business centered around small batch shampoo, soap, and lotion bars. Participating in this contest would be a win-win situation for my business and for Bramble Berry– I would be able to provide my customers with new scent options and help my business grow while providing Bramble Berry with useful feedback at the same time. Please choose me! Congrats on starting your own business, SO exciting! Your Cameo bar is awesome! Thanks for sharing Kathy. Here is our entry :http://sophiasnaturals.blogspot.com/2014/01/brambleberrys-soap-panel-entry.html WE ARE SO EXCITED!!! Good Luck Everyone :)!! Thanks for the entry Erin! Thanks for sharing, that is so kind Mokhe! Love all the fragrances you sell but my favorite product has to be the soap cutter! Can’t live without it! I don’t know why my FB link did not link above. Hopefully it will work here. Yes, the link worked and I enjoyed looking at your wonderful products, thanks for sharing! Here’s my entry! 🙂 best of luck to everyone who entered!! Would LOVE to be a part of the Winter 2014 S.O.A.P. panel! Who wouldn’t want a say in what is made available? Fragrance oils are the best part of the entire process… this is like setting a kid loose in the candy store. I’ll take any reason as an excuse to soap, and this sounds like a fun one! I would love to be one of the team members – I make a variety of products, and work in an office filled with ladies who love being my guinea pigs and are never shy about giving me great feedback, lol. Plus if they’ll let me, I’ll film their responses to the test scents to put onto my youtube channel too! Thank you for that lovely compliment, and I agree! I’m a huge fan. I got introduced to spap making from the Soap Queen videos and have been making bath fizzies,soap jellies, sugar/salt scrubs and I think you guys have the BEST products at affordable prices. If you were to pick me as a S.O.A.P PANELIST I would be over the moon. Love trying out new products, reviewing them and sharing with family and friends. This would be a great birthday gift, cause I’m writing a DIY PROJECT BOOK and this would be a addition to share with diy’ers like myself. And bring you new customers who will benefit from your services. You are too sweet…thank you for your excitement! Congrats on writing a book! Super fun idea! Thank you for posting the link and happy soaping! Dear BB team, my journey of learning to make soap started with Brambleberry and I still often come back to see what is new in the bath and body world. I use many of your fragrances in my line in condfidence knowing that they will last and stay true. One of my faves in the Kumquat and Mango combo. I would love the opportunity to help select some new and totally awesome FO’s. I, among many others, would ADORE the chance to be selected to test your possible new additions! I am trying to commit to making soap making youtube videos this year and would like to also record this if I am selected. Your soaps on your FB page are so pretty! I loved the Oatmeal & Honey, Red Apple and Ginger Ale (I have purchased other items and loved them too.) because they mixed well with other scents and can stand alone. would love to be apart of the panel!! You just picked some of my favorite fragrances Terry! Well this is the coolest thing ever! I’m stoked! Thanks for posting! Sadly, we aren’t accepting any International entries. Keeping my fingers crossed to be chosen for the new S.O.A.P. panel. Love all your fragrances and your company. You are all so helpful and kind when ever i have a problem or question. Your soap is beautiful, thank you for sharing. Thanks for the pin Somer! 10″ Silicone Loaf Mold!! Hope I make it! Thank you! Thank you for the post Janel! I would love to join the panel 🙂 I posted on my Facebook page one of my favorite fragrances. Thank you for sharing your favorite fragrance! Also, thanks for the link. I love the chipotle caramel fragrance that I received in the cupcake bath bomb kit. Thank you for offering this contest! I look forward to seeing the results! Isn’t the chipotle caramel a fun combo? Love Brambleberry and their involvement in the soaping community! Thanks for the pin and we love our community so much! I love this place…You have such a large selection of fragances and Ess. oil! Friendly people in customer service..always prompt… I enjoy learning about the benefits of ess. oils and use them often …But Have recently found my way to the frangrances and am ahaving so much fun with them…I love them solo or mixed with others…It would be a pleasure to be part of the panel…with 8 kids you can be sure each one will want to sniff every bottle!! I make soaps lotions and balms, what fun we would have…Thank you for your consideration! here is my FB link! That is quite the group of testers 🙂 I love that they all want to smell each one! Thank you for your support and kind words. We try really hard to make everyone as happy as you! I’d just like to make a suggestion: honeysuckle. It’s my absolute favorite fragrance in the world, and I would adore being able to get it from you guys. Have you seen this on our website? I would LOVE to be selected for Bramble Berry’s S.O.A.P. panel! I absolutely love every product I’ve purchased from both Bramble Berry and Otion! Here’s a link I put together to help soapers create my ladies camouflage soap. Thank you soo much for making purchases so easy and simple through Bramble Berry. I’m soo excited to experiment with new soap designs! My Christmas shaped and scented soaps were a big hit this year for all of my female family members! You are most welcome Annie! Soaps are always a big hit with my family too. I hope to be selected for Bramble Berry’s S.O.A.P. panel because I love trying/experimenting with new products, and I always share cool products with others and tell everyone about them. Also, I would be 100% committed and dependable. I would really love to have the honor of being part of the panel. Thanks for the opportunity. Cranberry Chutney reminds me of my childhood for some reason…I agree, it is a fabulous scent! Thank you for your post and excitement! Thank you Pam! Your soap pics are stunning! Please check my facebook out for my products. Scented Angel Luxurious Bath products. I’d LOVe to be a tester. Do you have a link you could send us Lisa? Brambleberry is my number one source for everything and I will tell you why. No other supply house for soap fragrances has such detailed descriptions along with reviews on how they behave! It is so nice to know if something will accelerate or give me time to play… and the fragrance calculator is invaluable! Thanks for the pin Dana! I case my Facebook link doesn’t work for some people. Thanks for the pin and following up with this link! It is versatile, thanks for sharing! I love scent testing! It’s the best part of my job! I would love to be on the soap panel! We are just finishing up our fall session of the Soaping Club and I have had such a fantastic time. There has been so much creativity and loads of collaboration among the participants. The soap panel would be a great follow up. Glad you are enjoying the Soaping Club! We are so glad to hear that. Here’s my entry! It’s pinned to the top of the page. Thank your for your entry Allie! I hope I get to be a tester! Thanks for the pin Diane! Thanks for the post Carissa! I just completed a lip balm, using your recipe on Soap Queen blog, http://www.soapqueen.com/bath-and-body-tutorials/lip-products/mother-days-lip-balm-passionfruit-rose-2/ And used a bunch of Bramble Berry lip fragrances (including the passion fruit rose one, which is amazing!!) https://www.brambleberry.com/Passionfruit-Rose-Fragrance-And-Flavor-Oil-P3336.aspx Not only is the balm awesome, I was very happy with the fragrance! I should be picked to join the S.O.A.P panel, because I absolutely love using all of Bramble Berry’s awesome supplies!! I would love to try out some of the mystery fragrances and gather feed back on them!! Pick me and you won’t be disappointed!! I adore homemade lip balm, so glad you got a chance to make some too! Passion fruit is my favorite fruit, so I of course, agree with you on the scent! It’s amazing. Thank you for the nice words and support! Thank you for sharing Margaret! I love Brambleberry. I use a lot of your fragrances in my body butters and sugar scrubs. Thank you for the support Donetra! What a lovely, clean scent! Thank you for the post Miranda. We do too! Thanks Tabitha! I would love to join this panel! I love testing new fragrances and have posted many reviews on YouTube! Thank you for your enthusiasm Elizabeth! See link above. Thank you. Thanks for applying and the soap you recently posted on FB is beautiful. Also, thanks for your support. This S.O.A.P. panel sounds awesome!! I am always up for trying out new scents!! I for one am a HUGE fan of citrus-y scents they are always so happy and bright smelling! Trying new scents would be great I would love to be a tester!! I love all the fragrances! Can’t decide which ones to use, I want to be a tester!! I love all the fragrances too Nancy! I order all my supplies from Brambleberry! They are great about shipping. And if there is ever a problem they are always there to answer all my questions. Although I have never had a problem but did have a question on scents one time. I love the scents I always have a hard time picking what I want for my soaps and lotions. I really live getting the samples. Makes it easier to pick scents. Thank you for the kind words! Our people work so hard to make sure our wonderful customer’s are happy!